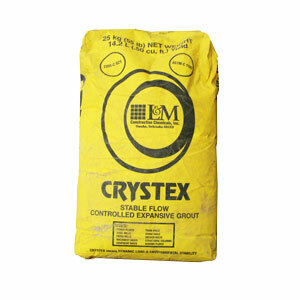 CRYSTEX is a ready-mixed, high strength, highly fluid, controlled expansion grout with superior dynamic load stability. CRYSTEX contains a balanced blend of washed and graded aggregates, portland cement, plasticizing agents, and a proprietary shrinkage compensating system, which controls positive expans..
CRYSTEX is a ready-mixed, high strength, highly fluid, controlled expansion grout with superior dynamic load stability. CRYSTEX contains a balanced blend of washed and graded aggregates, portland cement, plasticizing agents, and a proprietary shrinkage compensating system, which controls positive expansion in all directions. CRYSTEX is dimensionally stable once fully cured and is scientifically proportioned and ready for use at any consistency from plastic to fluid. CRYSTEX is used where a precision, non-shrink, high-strength, structural grout is required, such as: heavy equipment machinery bases, crane rails, pump and equipment bases in power plants, steel and paper mills, sewage treatment plants, keyways, bed plates where heavy repetitive loading occurs, anchor bolts and dowels, structural steel columns, bearing plates, load bearing masonry walls, light poles and highway signs. Can be mixed at a varying range of consistencies.